HE name "music" contains two ideas, both of them important in our modern use of the term: The general meaning is that of "a pleasing modulation of sounds." In this sense the term is used constantly by poets, novelists and even in conversation—as when we speak of the "music of the forest," the "music of the brook" or the "music of nature." There is also a reminiscence of the etymological derivation of the term, as something derived from the "Muses," the fabled retinue of the Greek god Apollo, who presided over all the higher operations of the mind and imagination. Thus the name "music," when applied to an art, contains a suggestion of an inspiration, a something derived from a special inner light, or from a higher source outside the composer, as all true imagination seems to be to those who exercise it. 2. Music has to do with tones, sounds selected on account of their musical quality and relations. These tones, again, before becoming music in the artistic sense, must be so joined together, set in order, controlled by the human imagination, that they express sentiment. Every manifestation of musical art has in it these two elements: The fit selection of tones; and, second, the use of them for expressing sentiment and feeling. Hence the practical art of music, like every other fine art, has in it two elements, an outer, or technical, where trained intelligence rules, and teaching and study are the principal means of progress; and an inner, the imagination and musical feeling, which can indeed be strengthened by judicious experience in hearing, but which when wanting cannot be supplied by the teacher, or the laws of their action reduced to satisfactory statement. 3. There is no fine art which reflects the activity of spirit more perfectly than that of music. There is something in the nature of this form of art which renders it particularly acceptable to quick and sensitive minds. If evidence of this statement were needed beyond the intuitive assent which every musical reader will immediately give, it could easily be furnished in the correspondence between the activity of mind in general and in the art of music in particular, every great period of mental strength having been accompanied by a corresponding term of activity in music. Furthermore, the development of the art of music has kept pace with the deepening of mental activity in general, so that in these later times when the general movement of mind is so much greater than in ancient times, and the operations of intellect so much more diffused throughout all classes, the art of music has come to a period of unprecedented richness and strength. 4. The earlier forms of music were very simple; the range of tones employed was narrow, and the habits of mind in the people employing them apparently calm and almost inactive. As time passed on more and more tones were added to the musical scales, and more and more complicated relations recognized between them, and the music thereby became more diversified in its tonal effects, and therein better adapted for the expression of a more energetic or more sensitive action of mind and feeling. 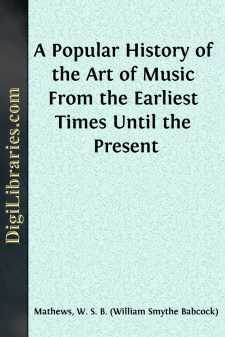 This has been the general course of the progress, from the earliest times in which there was an art of music until now.